NASA's Mars rover Curiosity has pounded into a Martian rock with its hammering drill for the first time, as this picture snapped by the robot on Feb. 2, 2013 shows. NASA's Mars rover Curiosity has pounded into a Red Planet rock with its drill for the first time, bringing the 1-ton robot a big step closer to initiating its first full-bore drilling operations. The Curiosity rover hammered the rock using the arm-mounted drill's percussive action over the weekend, completing another test along the path toward spinning the bit and biting into rock for the first time. 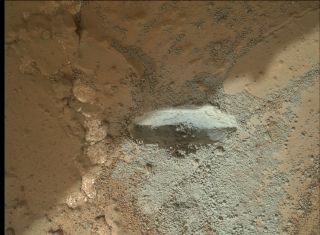 "We tapped this rock on Mars with our drill. Keep it classy everyone," Curiosity flight director Bobak Ferdowsi — who gained fame as "Mohawk Guy" during the rover's nail-biting landing on the night of Aug. 5, 2012 — wrote in a Twitter post Sunday (Feb. 3), sharing a photo of the pounded rock. Curiosity's drill can bore 1 inch (2.5 centimeters) into Martian rock, deeper than any rover has been able to go before. Using the drill and its associated systems is a complex operation, so the mission team has been building up slowly to the first drilling activity on the Red Planet. Last week, Curiosity performed some "pre-load" tests, pressing down on a rock with its drill in several different places to see if the amount of force applied matches predictions. The six-wheeled robot has also been carefully evaluating its target rock, which is part of an outcrop the mission team has named "John Klein," after a former Curiosity deputy project manager who died in 2011. Curiosity's main goal is to determine if its Gale Crater landing site could ever have supported microbial life. Along with the rover's 10 science instruments and 17 cameras, the drill is viewed as key in this quest, as it allows Curiosity to dig deep into Martian rocks for potential signs of past habitability. The mission team wants to test the drill out on a target with scientific value, and John Klein seems to qualify. The outcrop shows many signs of past exposure to liquid water, including light-colored mineral veins that were apparently deposited by flowing water long ago.